Ocean racing in the post World War 2 era was a changing sport. A far cry from the once ‘gentleman’s sport’ yacht racing was fast becoming a highly competitive field with new technologies and initiatives from progressive competitors. Stormvogel was the result of the radical ideas of Cornelius Bruynzeel, a Dutch construction timber manufacturer and a close collaboration of well-renowned designers. Cees Bruynzeel was mainly interested in speed, boat for boat, to be first across the line, to achieve line honours, that was his goal. His experience with Van de Stadt design, in 1949 Zeevalk, a 12.5 meter offshore racer, and in 1956, Zeeslang, a 9 meter radical light weight racer convinced him that light displacement was the key if you wanted to be first boat home. 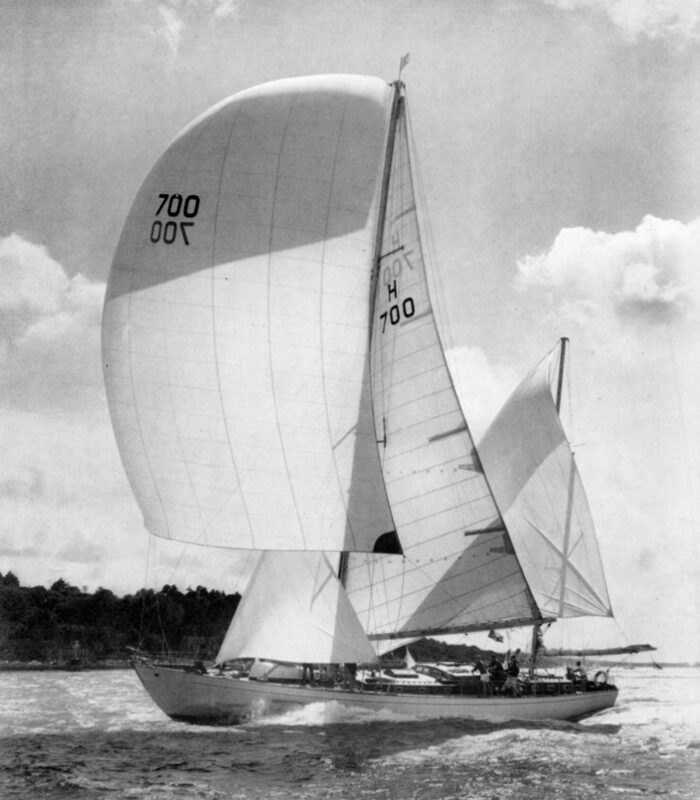 Both yachts were hard chine construction, built of Bruynzeel plywood, and had a spade rudder and attached fin keel. In 1959 he decided to apply this to the biggest possible yacht that was allowed to enter races, a boat with a 70 foot rating, and a length of approximately 23 meters, better known today as a Maxi. The yacht had to be as fast as possible, but it also had to be safe and easy to handle in all conditions, because it would be used as a charter vessel in between regattas. Celebrating his 60th birthday, Bruynzeel asked Van de Stadt to design the boat and make all the construction plans. However, the Van de Stadt Zaandam drawing office was very busy towards the end of 1959 so Bruynzeel subsequently turned to Olin Stephens, but Stephens did not dare risk his reputation as a designer with a project that he felt involved a considerable risk. Bruynzeel then asked the English designer Laurent Giles, who had experience with building large, lightweight stringer construction wooden hulls to come up with a design. While Giles was still working on a preliminary design, Bruynzeel by chance meet Capt. John Illingworth, a man who loved to experiment and Bruynzeel could not deny him the opportunity to put his vision down on paper. Bruynzeel was thus given two widely differing designs, making it difficult for him to choose. He asked Van de Stadt what his preference was, but he appeared not to be very enthusiastic about either plan, so during the following weekend Van de Stadt developed a preliminary design including lines. Bruynzeel subsequently had models of the three preliminary designs tested in the towing tank of the University of Southampton. The tests showed the Van de Stadt round bilge design had by far the best characteristics. The Van de Stadt Zaandam Office, however had absolutely no time available to develop the plan in great detail. It was therefore agreed that Van de Stadt would design the hull, the keel and the rudder, Illingworth would work out the rig plan, and Giles would take care of the construction plans and the overall co-ordination. The project became even more complicated when no suitable shipyard could be found to build such a yacht. Bruynzeel then decided to have the yacht built by his own company, Lamtico, in Stellenbosch, South Africa, where he had moved by then. That also had the advantage that he could supervise the building himself on a daily basis. Despite the complicated start-up phase, the actual building process went smoothly. Much credit also reflects on the personnel charged with the building of Stormvogel at Table Bay, South Africa. To build such a vessel and launch her on time in a yard unaccustomed to large yacht construction was indeed a great achievement. After the briefest of trials off Cape Town, Stormvogel sailed for England on the 3rd May, 1961 with a ships company of fourteen. She called at Saint Helena, Ascension Island and the Azores and arrived at Dartmouth, England, on the 22nd June. In spite of predominately light winds, the 7,660 mile voyage was completed in a good time averaging a speed of 7.6 knots. Her high basic speed was proven time and time again, particularly by her records in the Fastnet and Dinard races. Over a period of more than ten years Bruynzeel competed in virtually all the major races in all parts of the world. Particularly well known were the personal duels with the famous American ‘maximum raters’. In this way he promoted boat-for-boat racing on these big yachts. Stormvogel was the predecessor of the modern, lightweight Maxis.